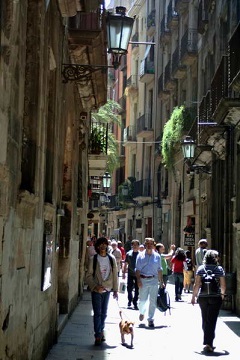 Travel back in time and experience the medieval time of Barcelona by visiting the Gothic Quarter, the Barrio Gotico. This is the oldest part of Barcelona and contains many old and beautiful churches, squares, markets and museums. You can also see parts of the ancient Roman walls and houses from the very first town in Barcelona that was called Barcino, which the Gothic quarter later was constructed around. Take the opportunity to sit down at one of the hundreds of bars, restaurants or cafes and enjoy the historic buildings.